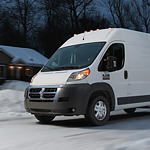 The ProMaster's list of capability features is long, so it is tough to pick a favorite. However, the Riverland Chrysler Dodge Jeep team has grown increasingly fond of its impressive engine. The standard 3.6L Pentastar V6 engine delivers a whopping 280 horsepower and is capable of driving a payload of up to 4,440 lbs. Even better, the engine features a silent chain timing drive which helps to make it more durable and reduce noise and vibration levels. The new ProMaster is also one of the most agile vehicles in its class. With a turning diameter of just 36 feet, getting through narrow city streets or busy parking lots is a breeze in this cargo van.